On a moonless Texas night in 1895, an ambitious young landowner suffers the loss of “the only woman he’s ever been fond of” when his wife dies during childbirth with the couple’s fourth boy, Karel. From an early age Karel proves so talented on horseback that his father enlists him to ride in acreage-staked horseraces against his neighbors. But Karel is forever haunted by thoughts of the mother he never knew, by the bloodshot blame in his father’s eyes, and permanently marked by the yoke he and his brothers are forced to wear to plow the family fields. Confident only in the saddle, Karel is certain that the horse “wants the whip the same way he wants his pop’s strap . . . the closest he ever gets to his father’s touch.” In the winter of 1910, Karel rides in the ultimate high-stakes race against a powerful Spanish patriarch and his alluring daughters. Hanging in the balance are his father’s fortune, his brother’s futures, and his own fate. Fourteen years later, with the stake of the race still driven hard between him and his brothers, Karel is finally forced to dress the wounds of his past and to salvage the tattered fabric of his family. 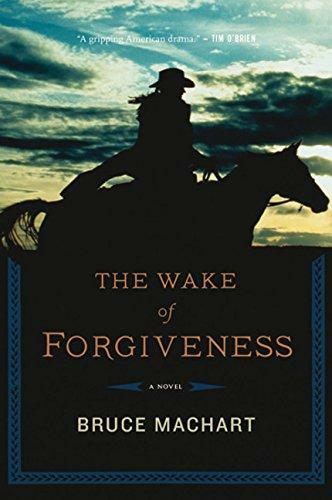 Reminiscent of Kent Haruf’s portrayals of hope amidst human heartbreak and Cormac McCarthy’s finely hewn evocations of the American Southwest, Bruce Machart’s striking debut is as well wrought as it is riveting. It compels us to consider the inescapable connections between sons and their mothers, between landscape and family, and between remembrance and redemption. Bruce Machart’s fiction has appeared in Zoetrope: All-Story, Glimmer Train, Story, One Story and elsewhere, and has been anthologized in Best Stories of the American West. A graduate of the MFA program at Ohio State University, he currently lives and teaches in Houston. The book opens with Karel’s birth, which is also the occasion of his mother’s death. How does this change the family dynamic? How does it introduce the themes of guilt and shame and how do you see these themes continue throughout the book? In the book’s opening pages, we see Sr. Villasenor establish himself at the local bank. When he is condescended to by the banker, how does he get his revenge? How are Villasenor and Skala different sorts of men? How are they the same? Discuss Karel’s relationship with his father. Vaclav never holds his infant son; later, the narrator says, “Karel wanted his pop’s strap, the stinging and unambiguous urgency of its attention, and, for Karel, the closest he got to his father’s touch” (p. 20). Where else do you see the correlation of violence with affection? How else does this correlation play out in Karel’s life? On pages 30–31, Karel recounts a nightmare in which his father is kicked by a horse, then a horseshoe is nailed to his hand. What does this image of crucifixion signify in the story? Vaclav is far from Christ-like, but what sacrifice happens in the book? What redemption? Karel is haunted by the absence of his mother. How does he seek maternal love? How does he confuse maternal love with something else? On page 43, Karel kicks a pregnant cow. Why does he do this? How do we know this act is premeditated? What sorts of connections might Karel have between violence and money, or value? Where would those have come from? The structure of the book is not strictly chronological. Why do you think the author chose to structure the book this way? How do the characters unfold through this broken narrative? What is gained by seeing Karel and the other characters at different points in their lives? Does Karel feel bonded with the Knedlik boys because of the way their fathers died? Was that a reliable trust? When you finally read the scene of Vaclav’s death, is it what you expected? Does this change how you feel about Karel? Discuss the pivotal horserace between Karel and Graciela. What made this race different than any other race? How is this race different than the one Karel ran against the Dalton boy earlier in the book? What are we to understand about Karel’s sportsmanship? After the race, during the fight that ensues between the Skala men, what does the author mean when he says the fight was “flawless in its wickedness”? Why does it feel like this fight was fated? What was gained, and what lost, in the fight? There are a few short passages in the book told from the point of view of Father Carew. Why do you think the author chose to switch the narration for these few moments? What do we gain from his perspective? Raymond Knedlik says to Karel, “‘You ain’t got any brothers, Skala, unless you’re talking about me and Joe here. Them others won’t claim you.’” (page 293). What does Karel think of this claim? What does being a brother mean to Karel? What do you think makes men into brothers? The title of the book is “The Wake of Forgiveness.” Who is forgiven? Why? What comes in the “wake of forgiveness”?